Look, I could justify it as a supported training run -- why not let someone else figure out the route, provide water, etc.? I could even justify it as another chance to pick up some hardware. I mean, you know how I love a good medal. But I'll be honest... it's because the race was in Idaho... and a race there would bring up my "state count" to FIVE. Sure, it's not a lot. But it's good to add another state to the list: Washington, Oregon, California, Florida, and now IDAHO. 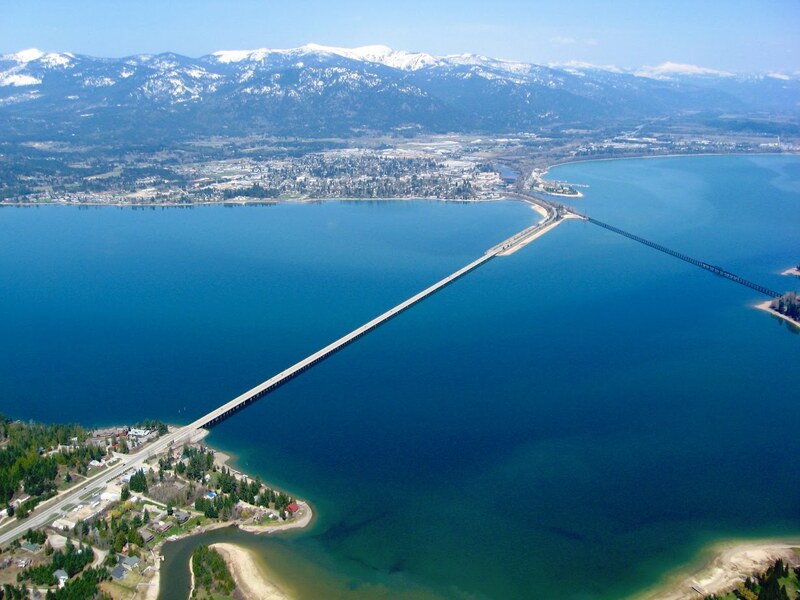 I registered for the Scenic Half a couple of months ago -- the date was good (fit with our training schedule) and Sandpoint looked pretty. Friday after work we hit I-90 and drove till it got dark -- stopping in sweet little Ritzville for the night. Saturday morning we were up early-ish and drove the rest of the way, arriving in Sandpoint around 11. We wandered around town -- super cute shops, really friendly people. Even a cute little farmers' market. Packet pickup was well organized and speedy. We got our numbers (1050 and 1142), our t-shirts (good looking but, um, SMALL -- more a compression shirt than anything else! ), and our goody bags. It's a sad state of affairs when a small race does better goody bags than Disney... but our bags had some treats, some icy hot packets, and -- best of all -- a souvenir "13.1" oval sticker. How awesome is that? So simple, but so lovely, too. Oh, and the Chamber of Commerce had also secured a number of runner's discounts -- another great touch. We took our swag and headed back to the hotel, stopping in at the 219 Tavern ("a Five Star Dive Bar") for a drink... which turned into two... but we just couldn't tear ourselves away from the fantastic decor and old-bar clientele. Oh, and their signature beer, the 219er, was surprisingly tasty... Then an early dinner at the hotel (where the "Root Burger" was the best home-made veggie burger I've ever eaten) and then back to the room to lay out our things for the morning. Slept reasonably well, but woke up to rain. Rain rain rain. Rain pounding on the metal roof, rain pouring over the edge of the balcony, rain making the ducks on the lawn really happy. But I was resolved -- we had come to Idaho to race, so race we would. I did, however, make one very big error. We were so close to the start that we didn't need to get up early... so for an 8:30 start, we set our alarm for 7:45. I had brought bagels and cheese and peanut butter... and ate a whole bagel. With cheese. At 8:15. Is it any wonder that I spent the first 5 miles trying not to throw up and struggling to breathe. It's hard to breathe with a mass of bagel in your belly. Anyway, we walked the 100 yards to the start and joined the crowd -- 500 people had registered for the half marathon. It was very low key -- we stood in a single "corral" (to separate us from the other distances), listened to the national anthem, and groused a little about the drizzle. The organizers were clever and started the 10Kers 15 minutes after us, and the 5Kers 15 minutes after them -- so the only "other distance" people we saw were the very fast frontrunners in the 10K race, who caught up with us just before their turnaround. As such, it was difficult to tell how many people were doing the other distances. The course started in a lakefront park, then ran a couple of blocks through town, and then out along what is usually a bike trail but is currently a very muddy path -- seems that they're doing some big work on the approach road. But then we went back on to a paved bike trail. and headed out across The Long Bridge. Once across the bridge, we ran along a bike trail -- much nicer and quieter than the highway just a few yards away. With the field so small, I never really felt crowded, which meant we could have had quite an easy time of it. Except for the fact that I was having a hard time breathing, that is. The rain came and went, sometimes almost stopping, sometimes pelting down. I started off in my rainpod jacket, got too hot, and then just decided to go ahead and get drenched. Was happy to have brought a hat so that at least the rain stayed out of my eyes. Great job with the organization of the event overall. Not sure we need to run the race again next year, but I would definitely consider returning to Sandpoint when the weather is a bit better. 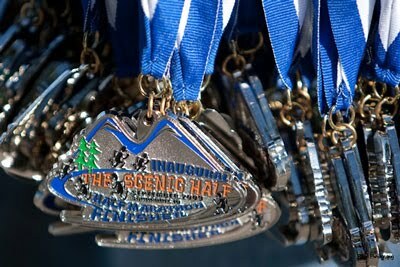 For posterity's sake, here's the course map for the Scenic Half Marathon in Sandpoint, Idaho. My boyfriend remembers having the most amazing root burger at a hotel restaurant in Sandpoint, Idaho about two years ago. I found your blog in my Google search. Do you remember the name of the hotel or restaurant where you had the root burger? Hi Sharon - It was the restaurant at the Best Western Edgewater Resort -- but I can't figure out what the name of the restaurant was, or whether it still exists. But, yeah, that root burger was amazing!!! Let me know if you find it again.